Scorpio is the most intense and powerful character in the Zodiac. Even calm and controlled, there is a simmering emotional intensity just under the surface. Picture a beautiful mountain beneath the surface of a calm sea that can burst into an eruption without notice. But with a little quiet observation, others will be aware of the harnessed aggression, the immense forcefulness, magnetic intensity (and often strangely hypnotic personality) under the tranquil, but watchful composure of this sign. In conventional social gatherings they are pleasant, thoughtful in conversation, dignified, and reserved, yet genial and courteous. These individuals sometimes possess penetrating, almost Svengali-like eyes which can make a shyer person feel naked and defenseless in their gaze. This sign can often give the appearance of being withdrawn from the center of activity, but those who know them well will recognize the subtle watchfulness that's part of their character. They need great self-discipline, because they are able to recognize the qualities in themselves that make them different from other humans. They know their utterly conventional natures can be used for great good or great evil. 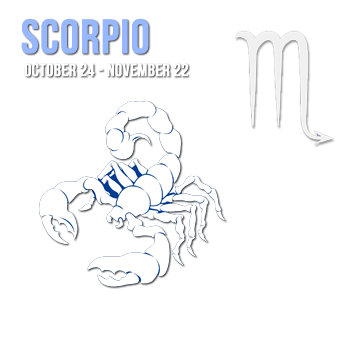 Scorpio has immense willpower and can be doggedly determined in any quest. Their depth of character and passionate conviction can be thoroughly overwhelming, yet they are deeply sensitive and easily moved by their emotions. Their sensitivity, together with a penchant for extreme likes and dislikes allows them to be easily hurt and they are quick to detect insult or injury to themselves (real or perceived) and easily aroused to unmitigated anger. This can express itself in destructive speech or action so that they make lifelong enemies because they are so outspoken. These sometimes volcanic individuals find it difficult not to be overly critical of anything or anyone to whom they have taken a dislike. They can harness their abundant energy constructively, moderating their over self-confidence with a shrewdness and their ambition with magnanimity toward others (provided they like them). Only as leaders can they relate to and can be overly blunt to those they dislike to the point of appearing cruel. Scorpio can act in a vindictive manner toward others they perceive as having the very faults contained within themselves. They do, however, make excellent friends, provided their companions do nothing to impugn Scorpio's honor of which they are very jealous. Part of the negative side of Scorpio nature is a tendency to shed friends once they cease to be useful, but the evolved native is aware of, and fights this tendency. Scorpio is fortunate to have strong reasoning powers that are tempered with imagination and intuition. These gifts, together with critical perception and analytical capacity, enable Scorpio to penetrate complexities beyond the average. They have a better chance to become geniuses than any other sign. But being such charismatic characters they can sink into the depths of depravity if they take the wrong path. The intensity of their nature can exaggerate harmful tendencies into vices far greater than the normal. This sign is extremely and powerfully gifted. They can find fulfillment in a wide variety of fields. Their inner intensity can result in the ice-cold self-control and detachment of the surgeon, the concentration of the research scientist, and the heroism of the soldier. They are amazingly suited for any profession in which analysis, investigation, research, dealing with practicalities and the solving of mysteries are important, can appeal to them. Police and detective work, espionage and counterespionage, the law, physics or psychology may attract Scorpio. They can become masters of the written and spoken word thrilling their audience with their descriptive prose. They can be the most persuasive orators and find fulfillment as diplomats. If they make the Church their profession, their inner intensity can express itself in the spiritual fervor of the mystic or the thaumaturgy or miracle working. Scorpios are passionate lovers, the most sensual of all the signs. Union with their beloved is a sacrament. Their overriding compulsion in loving is to use their power to transcend beyond themselves and to lose themselves in their partners in an almost mystical ecstasy. In this day they discover the meaning of that union sensing that which is greater than individuality. Theirs is a need to enter into a marriage of the spirit as well as the flesh. Debauchery and perversion are always dangers, and Scorpios can become sadistic monsters of sensuality and eroticism. Their feelings can be so intense that even when their love is of the highest and most idealistic kind, they can still be protagonists in tragic, even violent romances or be considered "star-crossed lovers".